A process often must be routed to the appropriate person or team to complete a task. For example, the manager of a cost center must approve an employee expense or a member of the accounting team must process a refund. In these cases, the assignment can be routed to a worklist or a workbasket. Before you begin, take a look at the default configuration for an assignment. As each step begins, routing is set to be completed by the current operator. 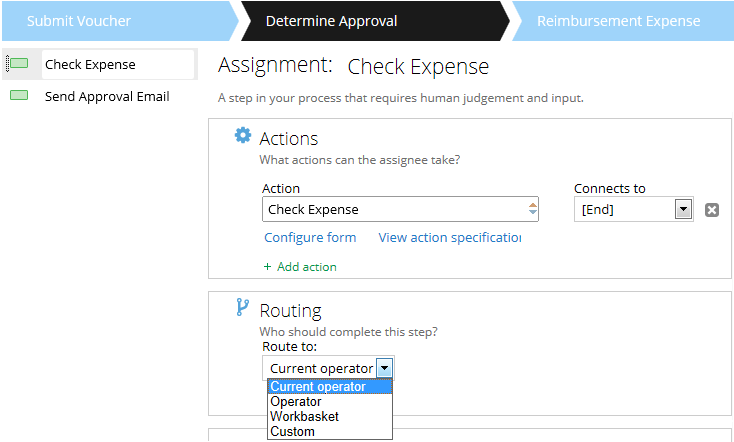 To route to an operator, change the Route to field in the properties panel to Operator. 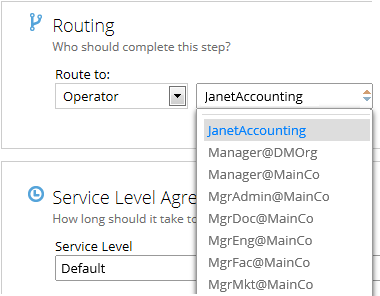 When the field has been updated, a list of operator IDs is made available in an auto-complete field. To route to an operator, select an operator ID from the list. In the example below, an expense voucher is being routed to Janet in Accounting. 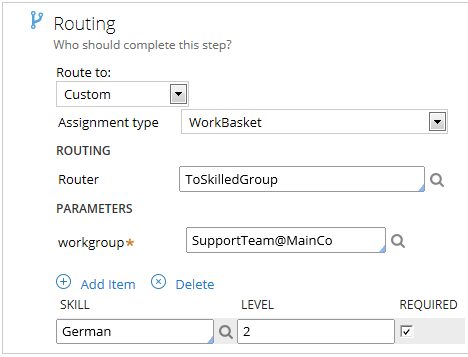 To route to a workbasket, change the Route to field in the properties panel to Workbasket. 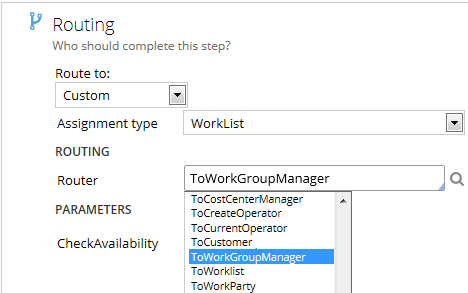 When the field has been updated, a list of workbasket names is displayed in an auto-complete field. To route to a workbasket, select a name from the list. In the example below, an expense voucher is being routed to the PurchaseReview workbasket so that a member of the team can review the request. For more information on Dependency, External, and Agent assignment types, see Flow form - Editing Assignment shape properties. In the example below, a request to take time off is being routed to the worklist that belongs to the manager of the current operator. In the example below, a support request is being routed to the workbasket of the support team. The customer requires that the request be completed by a team member with German language skills. The following steps demonstrate how to route a request for reimbursement to the department’s cost center manager. Click the Open icon next to the decision table name to create the decision table. Use the prepopulated parameters to save the decision table in the context of the current assignment, and click Create and open. Set the condition for the routing table to be the requestor’s department. For example, if the page property is Employee with a Department field, then the condition property would be .Employee.Department. 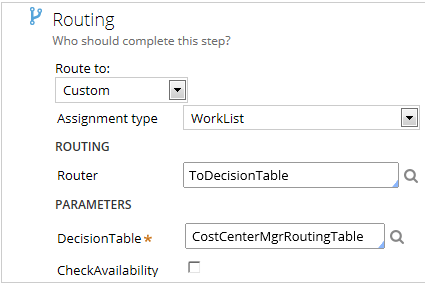 Complete the CostCenterMgrRouting table by specifying the cost center manager for each department. Save changes to the decision table and then close the Decision Table tab. Save changes to the case type.